This review originally appeared in the Vol. 24 No. 2 / Fall-Winter 2017 issue of West 86th. Studies in Western Tapestry 8. 290 pp. ; 100 ills. ; unnumbered color pls. Among the understudied areas of the history of the decorative arts in France is the manufacture of furniture and decorative objects at the Royal Gobelins Factory in the seventeenth century. The Gobelins name is synonymous with the production of fine tapestry but not furnishings. The important research on the manufacture of tapestries at the Gobelins that was completed by Maurice Fenaille a hundred years ago has not yet been superseded.1 Now we have at last Florian Knothe’s Manufacture des meubles de la couronne aux Gobelins under Louis XIV to provide the necessary institutional history for the entire Gobelins enterprise. The Gobelins was a French royal manufactory that produced not only tapestry but also case furniture, joined woodwork, inlay of hard stone (pietra dura) and mixed natural and metal materials, cast and gilded bronze sculpture and fittings for furniture as well as building hardware, and stone sculpture and trim for architectural interiors. Its purpose was to provide the component elements ranging from door knobs and marble door moldings to tapestry and silver ornaments for the palaces of France’s kings and members of his household, the broadly conceived Maison du Roi. And yet, the craftsmen who created luxuries for the crown have little independent identity in the history of the decorative arts, even though they were the greatest practitioners of their day. And that was precisely what the monarchy intended: a largely anonymous, corporate identity that produced the very finest works exclusively for the kings of France. 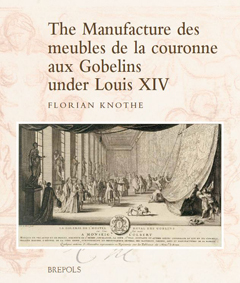 Florian Knothe’s publication has now arrived to give us—with text in English and supporting documents in the original French—the fundamental information necessary to understand the creation, organization, and purpose of the Manufacture des Gobelins. What readers will learn is how the Gobelins Manufactory differed from the many independent artists and craftsmen working under royal sponsorship but outside the organizing structure and discipline that was unique to the Gobelins. This book is now essential reading for students of the history of the decorative arts in ancien régime Europe, both for its text but also for its appendices, which reproduce the original foundational archival documents. The book is based on Knothe’s PhD thesis submitted to the Johannes Gutenberg-Universität in Mainz in 2011 under the supervision of Gregor Wedekind. Beautifully produced by Brepols, it includes thirty-seven pages of original documents, twenty-four pages of bibliography, and twenty-three pages of endnotes. There are copious and excellent color and black-and-white illustrations throughout. There are several reasons why furniture and furnishings are not readily associated with the Gobelins. Foremost among these is the rarity of surviving objects. Virtually all of the extraordinary silver furniture and large silver vessels and light fixtures that were made for Versailles were melted down to pay the costs of wars at the order of their patron, Louis XIV. The second reason is that the relatively few surviving pieces of furniture were dispersed, largely owing to the French Revolution, and are now in private hands or in a very few museum collections. But the real cause of our lack of knowledge about the producers of portable objects at the Gobelins is the intentional anonymity that the French monarchy consciously imposed on the Gobelins’ products. Jean-Baptiste Colbert, the king’s finance minister, wanted to create a “brand” name for the collaborative workshops at the Gobelins that reflected glory on Louis XIV and his reign rather than on individuals. To this end, the individual craftsmen were not celebrated, nor did their works, often collaboratively produced, carry their names. Contemporary publications only identify by name the director of the manufactory, the painter Charles Le Brun (1619–90), who was also the principal designer. Knothe discusses a unique and extremely revealing letter published in the Mercure Galant on March 10, 1673 (70), in which Charles Le Brun responded to a question from the editor, listing and crediting his craftsmen as individuals. Some of the names are of artists who have never had any monographic study, and very few have had their works for the Crown attributed to them. Among those Le Brun named are Domenico Cucci (glyptic stonework and both large ebony cabinets and jewelry miniatures), Jean-Baptiste Tuby (sculpture), Jean Jans (tapestry), Claude de Villiers (silverwork), and Alexis I Loir (sculpture in relief and large garden basins). Le Brun was only writing about artists who were currently active in 1673, so there is no mention of the dozens of other craftsmen and designers whom he directed both before and after the publication. Knothe dismisses the common misunderstanding that no furniture was created at the Gobelins after 1690 and argues that there continued to be production of three-dimensional work into the eighteenth century, but that the earlier generation of artists was only gradually replaced with smaller numbers of craftsmen. But Knothe’s purpose is not to give us monographic treatments of the artists who worked at the Gobelins but rather to explain how the Gobelins developed and functioned as a manufactory. His chapters on the lives, marriages, and living conditions of the artisans explain the systems by which the manufactory could thrive while hidden within the larger protective royal household—the Maison du Roi—and its arts administration, the Surintendance des Bâtiments, Jardins, Arts, Académies et Manufactures du Roi. The coordination among the trades made the Gobelins as a manufactory distinct from the craftsmen with royal privilege who lived and worked in studios in the Louvre in central Paris or elsewhere. In the Louvre, every artist or artisan was independent, producing his own work without any overarching organizational structure or supervision. But at the Gobelins, the director, either Le Brun or his successors, very specifically orchestrated the collaborative interaction of various craftspeople to produce distinctive objects of superlative quality, design, and rarity of materials. So we should think of the Gobelins as an extension of the architectural interior design of palaces, where the chief architect also coordinated the design and execution of the decorative features. These included over-the-top silver light fixtures, brilliantly gilded espagnolettes for window hardware with matching hinges and door knobs, imposing ebony and inlaid case furniture, polished sculpted marble door frames, floor mar-quetry, carved wood doors and paneling, and tapestry hangings that often prominently included—as an act of self-promotion—the furniture, silver, and tapestry designs which were produced at the Gobelins and would have been displayed in the same rooms with the tapestries! Knothe’s second chapter provides a meticulous and much-needed account, going back to the reigns of François Ier in the mid-sixteenth century and Henri IV in the late sixteenth and early seventeenth centuries, of how the French monarchy sought to improve the quantity and quality of decorative art manufactures by inducing an influx of new talent to augment the work of the masters of the Parisian maîtrise. The maîtrise, or guild system, Knothe explains, was structured to protect the existing size and scope of Parisian craft production. It rigidly controlled the number of apprentices who could be trained, prevented growth in the number of masters, and prohibited masters in one craft from practicing in a competing skill (for example, a cabinetmaker could not also construct the metal hardware for furniture). As a consequence, the maîtrise tended to stifle innovation in favor of protecting the existing status of its members. By the guild rules, foreign workers and Frenchmen from the provinces were blocked from entering the Parisian orbit. But this was entirely contrary to the desire of the more cosmopolitan French monarchs and courtiers, who wanted to introduce Italian and Flemish design and innovative craftsmanship. Thus, Knothe describes, the French kings sought to create mechanisms, tentatively and sporadically at first, that created a system of royal charter appointments. Royal brevets, or patents awarded to foreign and non-Parisian French skilled workers, exempted them from the control of the maîtrise. A major precedent was set under King Henri II in 1547 when the Parlement of Paris (the judicial branch of government) ratified the precise description of the privileges and responsibilities that were attached to a royal patent, which exempted a royal workshop from the traditional guild-protected practices for the training of apprentices (19). Certain distinct zones within Paris were not under guild control, including monastic lands and, for example, the Temple and royal palaces such as the Louvre, which were protected by distinct seigneurial rights. Thus, even long before the formation of the manufactory at the Gobelins, the legal basis for privileging immigration of decorative arts craftsmen was established. By the mid-seventeenth century, royal authority was also being used to establish protected manufactories outside Paris, again away from the guild’s zone of authority. During the youth of Louis XIV, his minister of finance, Jean Fouquet, had secured the king’s agreement in 1660 to extend royal protections and privileges to the tapestry workshop he had established at Maincy in 1658 specifically to supply the decoration for his Château de Vaux-le-Vicomte (26). Fouquet employed the young Charles Le Brun at Maincy to supply the designs that would be woven by non-Parisian tapestry workers. After the famous episode of Louis XIV’s abrupt imprisonment of Fouquet for malfeasance with royal funds, evinced by the grandeur of his residence at Vaux, Louis XIV and his minister Jean-Baptiste Colbert transferred the entire Maincy workshop in 1662 to the Parisian faubourg where the small Bièvre River flowed through a district called Les Gobelins. This area south of the Seine near the ancient church of Saint-Marcel dedicated to the patron saint of Paris was the location of the city’s old wool-dyeing and tanning works, both of which took advantage of the Bièvre to carry off their pollution. Building on the traditional crafts of the faubourg Saint-Marcel, the crown installed and financed the new Manufacture royale des meubles de la Couronne aux Gobelins (Royal Manufactory of Crown Furnishings at the Gobelins). The term meubles is used in the sense of portable or moveable goods belonging to the Crown, in contradistinction to immeuble, or the fixed physical or unmovable crown buildings: thus the distinction between the two royal services—the Direction des Bâtiments du Roi for structures and the Service du Garde Meuble de la Couronne for all of the moveable furnishings of every material. And so was invented the decorative arts manufacturing arm of the Maison du Roi. Even though the workshops for artists and artisans at the Louvre were founded by Henri IV as an older version of royal support for the fine and decorative arts, those craftsmen did not constitute a special service to the crown. Only the royal mint in the Louvre was a royal manufactory. So while the king might give individual royal commissions to the artists in the Louvre, his administrators controlled the production of the Gobelins collectively and directly. All of the output of the Gobelins belonged to the king, and it could only pass into someone else’s possession by royal gift. Anyone could commission work from the independent artisans with royal patents who lived and worked in the Louvre. I will be surprised if Knothe’s book does not launch a dozen PhD dissertations. For an astute advisor and student, the book is a veritable road map of what we do not yet know about the manufacture of furnishings in France during the ancien régime. Knothe helps us realize that we should be asking who exactly made the woodwork doors, hardware, stonework, and bronze mounts in the interiors at Versailles, so that we can discern which of these designers and artisans deserve monographs. While Pierre Gole (ca. 1620–84)2 and André-Charles Boulle3 have (only recently) been given their first monographic scholarly attention, we readily recognize that Domenico Cucci and many others merit greater study. Books should be written on the Flemings and Italians who migrated to France, drawn by the new royal patents. What became of the Huguenot craftsmen at the Gobelins after the Revocation of the Edict of Nantes? For these and dozens of other questions, Florian Knothe’s publication gives us a firm and factual foundation upon which to build. Alden R. Gordon is the Paul E. Raether Distinguished Professor of Fine Arts at Trinity College in Hartford, Connecticut. 1. Maurice Fenaille, État-général des tapisseries de la manufacture des Gobelins, depuis son origine jusqu’à nos jours, 1600–1900, 6 vols. (Paris: Imprimerie nationale, Hachette, 1903–23). 2. Theodoor Herman Lunsingh Scheurleer, Pierre Gole: Ébéniste de Louis XIV (Dijon: Faton, 2005). 3. While Boulle received a monographic exhibition in 2009–10 at the Museum für Angewandte Kunst in Frankfurt am Main, the publication must be used with caution: André-Charles Boulle 1642–1732: Un nouveau style pour l’Europe, exh. cat., ed. Jean-Nérée Ronfort (Paris: Somogy, 2009). The exhibition catalogue also exists in an English version: André-Charles Boulle 1642–1732: A New Style for Europe (Paris: Somogy, 2012).